Covent Garden is a district in Greater London, on the eastern fringes of the West End, between Charing Cross Road and Drury Lane. It is associated with the former fruit-and-vegetable market in the central square, now a popular shopping and tourist site, and with the Royal Opera House, which is also known as "Covent Garden". The district is divided by the main thoroughfare of Long Acre, north of which is given over to independent shops centred on Neal's Yard and Seven Dials, while the south contains the central square with its street performers and most of the historical buildings, theatres and entertainment facilities, including the London Transport Museum and the Theatre Royal, Drury Lane. In theater, a box is a small, separated seating area in the auditorium or audience for a limited number of people for private viewing of a performance or event. A balcony is a platform projecting from the wall of a building, supported by columns or console brackets, and enclosed with a balustrade, usually above the ground floor. Sir William Davenant, also spelled D'Avenant, was an English poet and playwright. Along with Thomas Killigrew, Davenant was one of the rare figures in English Renaissance theatre whose career spanned both the Caroline and Restoration eras and who was active both before and after the English Civil War and during the Interregnum. Lincoln's Inn Fields is the largest public square in London. It was laid out in the 1630s under the initiative of the speculative builder and contractor William Newton, "the first in a long series of entrepreneurs who took a hand in developing London", as Sir Nikolaus Pevsner observes. The original plan for "laying out and planting" these fields, drawn by the hand of Inigo Jones, was said still to be seen in Lord Pembroke's collection at Wilton House in the 19th century, but is untraced. The grounds, which had remained private property, were acquired by London County Council in 1895. It is today managed by the London Borough of Camden and forms part of the southern boundary of that borough with the City of Westminster. The Theatre Royal, Drury Lane, commonly known as Drury Lane, is a West End theatre and Grade I listed building in Covent Garden, London, England. The building faces Catherine Street and backs onto Drury Lane. The building is the most recent in a line of four theatres which were built at the same location, the earliest of which dated back to 1663, making it the oldest theatre site in London still in use. According to the author Peter Thomson, for its first two centuries, Drury Lane could "reasonably have claimed to be London's leading theatre". For most of that time, it was one of a handful of patent theatres, granted monopoly rights to the production of "legitimate" drama in London. Harlequin is the best-known of the zanni or comic servant characters from the Italian Commedia dell'arte. The role is traditionally believed to have been introduced by Zan Ganassa in the late 16th century, was definitively popularized by the Italian actor Tristano Martinelli in Paris in 1584–1585, and became a stock character after Martinelli's death in 1630. In 1734, Covent Garden presented its first ballet, Pygmalion. Marie Sallé discarded tradition and her corset and danced in diaphanous robes. 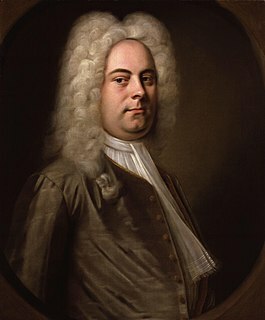 George Frideric Handel was named musical director of the company, at Lincoln's Inn Fields, in 1719, but his first season of opera, at Covent Garden, was not presented until 1734. His first opera was Il pastor fido followed by Ariodante (1735), the première of Alcina , and Atalanta the following year. There was a royal performance of Messiah in 1743, which was a success and began a tradition of Lenten oratorio performances. From 1735 until his death in 1759 he gave regular seasons there, and many of his operas and oratorios were written for Covent Garden or had their first London performances there. He bequeathed his organ to John Rich, and it was placed in a prominent position on the stage, but was among many valuable items lost in a fire that destroyed the theatre on 20 September 1808. In 1792  the architect Henry Holland rebuilt the auditorium, within the existing shell of the building but deeper and wider than the old auditorium, thus increasing capacity. Marie Sallé (1707–1756) was a French dancer and choreographer in the 18th century known for her expressive, dramatic performances rather than a series of "leaps and frolics" typical of ballet of her time. Il pastor fido is a pastoral tragicomedy set in Arcadia by Giovanni Battista Guarini, first published in 1590 in Venice. On 5 March 1856, the theatre was again destroyed by fire. Work on the third theatre, designed by Edward Middleton Barry, started in 1857 and the new building, which still remains as the nucleus of the present theatre, was built by Lucas Brothers  and opened on 15 May 1858 with a performance of Meyerbeer's Les Huguenots . The Royal English Opera company under the management of Louisa Pyne and William Harrison, made their last performance at Theatre Royal, Drury Lane on 11 December 1858 and took up residence at the theatre on 20 December 1858 with a performance of Michael Balfe's Satanella  and continued at the theatre until 1864. The Royal Opera House reopened on 20 February 1946 with a performance of The Sleeping Beauty in an extravagant new production designed by Oliver Messel. Webster, with his music director Karl Rankl, immediately began to build a resident company. In December 1946, they shared their first production, Purcell's The Fairy-Queen , with the ballet company. On 14 January 1947, the Covent Garden Opera Company gave its first performance of Bizet's Carmen . By 1995, sufficient funds from the Arts Lottery through Arts Council England  and private fundraising had been raised to enable the company to embark upon a major £213 million reconstruction of the building by Carillion,  which took place between 1997 and 1999, under the chairmanship of Sir Angus Stirling. This involved the demolition of almost the whole site including several adjacent buildings to make room for a major increase in the size of the complex. The auditorium itself remained, but well over half of the complex is new. Thomas Augustine Arne was an English composer. He is best known for his patriotic song Rule Britannia, a version of God Save the King, which became the British national anthem, and the song A-Hunting We Will Go. 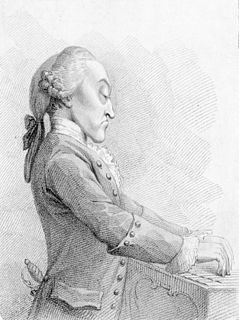 Arne was a leading British theatre composer of the 18th century, working at Drury Lane and Covent Garden. Joseph Grimaldi was an English actor, comedian and dancer, who became the most popular English entertainer of the Regency era. In the early 1800s, he expanded the role of Clown in the harlequinade that formed part of British pantomimes, notably at the Theatre Royal, Drury Lane and the Sadler's Wells and Covent Garden theatres. He became so dominant on the London comic stage that the harlequinade role of Clown became known as "Joey", and both the nickname and Grimaldi's whiteface make-up design were, and still are, used by other types of clowns. Grimaldi originated catchphrases such as "Here we are again! ", which continue to feature in modern pantomimes. Widow Twankey is a female character in the pantomime Aladdin which takes place in either China, Arabia or Persia. The character is a pantomime dame, portrayed by a man; and is a comic foil to the principal boy, Aladdin—played by an actress. The Theatre Royal is owned by Scottish Opera and is the oldest theatre in Glasgow and the longest running in Scotland. Located at 282 Hope Street, its front door was originally round the corner in Cowcaddens Street. It currently accommodates 1,541 people. The theatre opened in 1867, adopting the name Theatre Royal two years later. It is also the birthplace of Howard & Wyndham Ltd, owners and managers of theatres in Scotland and England until the 1970s, created by its chairman Baillie Michael Simons in 1895. It was Simons who as a cultural entrepreneur of his day also promoted the building of Kelvingrove Art Gallery and Museum and Glasgow's International Exhibitions of 1888 and 1901. William Reeve was an English theatre composer and organist. Harriet Augusta Sinden (1877–1950), better known as Topsy Sinden, was an English dancer, actress and singer. She was best known for her performances in Edwardian musical comedy and pantomime, both in London and on tour. Sinden was an accomplished tap dancer and skirt dancer. ROH2 was the contemporary arm of the Royal Opera House until 2012, commissioning and producing dance and contemporary opera works in the Linbury Studio Theatre, Clore Studio Upstairs, Paul Hamlyn Hall and various other locations situated both within the Royal Opera House and outside. ROH2 also provided additional artistic resource to partners and associate artists in order to help the organisation realise its strategic aims. ROH2 focused on developing the art forms, creating opportunities for emerging artists and attracting new and diverse audiences to the Royal Opera House. From the start of the 2012/13 season the work of ROH2 has been undertaken by the 'studio programmes' of the Royal Opera and the Royal Ballet. Joseph Samuel William Grimaldi, better known as J. S. Grimaldi or JS Grimaldi, was an English stage actor, comedian and dancer, who frequently played the role of Clown in the harlequinades that accompanied nineteenth-century pantomimes. He was the son of Joseph Grimaldi, who popularised the role of Clown in the early 1800s. John Peter Bologna (1775 –1846), known as Jack Bologna on stage, was an Italian actor and dancer, who spent much time in England popularising the role of Harlequin in Georgian pantomimes and harlequinades in the early part of the 1800s at the Sadler's Wells and Covent Garden Theatres. Carlo Antonio Delpini was an Italian pantomimist and theatrical manager. William Roxby Beverly or Beverley (c.1810–1889) was an English theatrical scene painter, known also as an artist in oils and watercolour. William John Lawrence, writing in the Dictionary of National Biography, considered him second only to Clarkson Stanfield among British scene painters of the 19th century. William Henry Schofield Payne was an actor and pantomimist who created much of the stage business connected with the character Harlequin. He was the father of the Victorian era pantomime clowns the Payne Brothers. ↑ Historic England (9 January 1970). "The Royal Opera House (1066392)". National Heritage List for England . Retrieved 9 July 2015. ↑ 'The Killigrew and Davenant patents' Survey of London vol. 35 pp 1–8. ↑ John Rich as Harlequin [ permanent dead link ] (PeoplePlayUK – Theatre Museum) accessed 22 July 2008. ↑ The Old Price Riots Archived 31 May 2008 at the Wayback Machine (PeoplePlayUK – the Theatre Museum (at the V & A) accessed 1 July 2006. ↑ Early Pantomime Archived 5 May 2008 at the Wayback Machine (PeoplePlayUK – the Theatre Museum (at the V & A) accessed 22 July 2008. ↑ "Boz" (ed.) ( Charles Dickens ), Memoirs of Joseph Grimaldi, 1853 edition with Notes and Additions by Charles Whitehead , accessed 22 February 2007. ↑ "Theatres Compete in Race to Install Gas Illumination – 1817" (PDF). Over The Footlights. Retrieved 20 May 2014. ↑ History Archived 7 April 2014 at the Wayback Machine (Royal Opera House) accessed 18 December 2012. ↑ Louis-Antoine Jullien (in French) accessed 21 December 2007. ↑ Chisholm, Hugh, ed. (1911). "Jullien, Louis Antoine" . Encyclopædia Britannica . 15 (11th ed.). Cambridge University Press. p. 551. ↑ Parker 1900, p. 39. ↑ "Charles Thomas Lucas at Oxford Dictionary of National Biography". Oxforddnb.com. Retrieved 4 May 2013. ↑ Reviews, "Drury-Lane Theatre", The Times , 13 December 1858, p. 10. 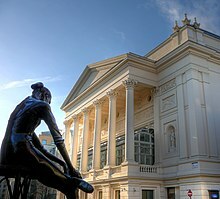 ↑ "UKTW Archive, London Royal Opera House". UK Theatre Web. Retrieved 14 March 2018. ↑ Higgins, Charlotte (28 October 2008). "Disharmony over Royal Opera's plan to go north". The Guardian . Guardian Media Group. ↑ Staff writer (31 October 2008). "Northern opera proposal evaluated". BBC News . BBC. ↑ Brown, Mark (25 June 2009). "Threat to plan for Royal Opera House in the north". The Guardian . Guardian Media Group. ↑ Staff writer (3 November 2010). "ROH shelves its plans to move north". The Stage . The Stage Media Company Ltd. Alternative link. ↑ Sharp, Rob (27 October 2010). "Royal Opera House shelves move north". The Independent . Independent Print Ltd.
Wikimedia Commons has media related to Royal Opera House Covent Garden .